The Russian-financed search engine CocCoc, founded by three Vietnamese students, aims at challenging Google's supremacy in the Asian market. 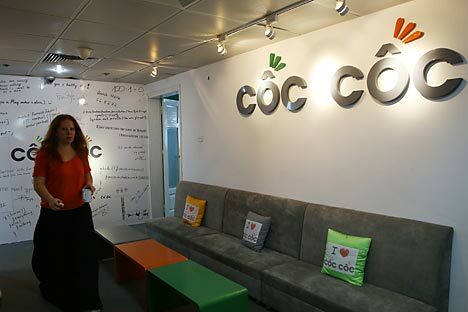 CocCoc, the search engine in Vietnam launched in May this year, is not the typical startup. The Russian-financed company was founded by three Vietnamese students who were developers at an experimental search engine in Moscow. Unlike the stereotype of a startup with an idea and a prototype, CocCoc (or 'Knock Knock' in English) is in a much stronger position. Already, it is an emerging competitor to Google in Vietnam. In a study conducted by CocCoc, out of the results from real-life local searches, 33 to 37 percent generated accurate and relevant results, compared to no result from Google for those same searches. CocCoc's products are built specifically for the Vietnam market, said Victor Lavrenko, CEO of CocCoc. "All [our] services and their special features are tailored to the needs of Vietnamese users only, which creates a huge competitive advantage in the local landscape," he said. Lavrenko is part of a growing community of Russian entrepreneurs in Vietnam. Lavrenko had been a co-founder of the experimental search engine, nigma.ru, and previously co-founder of Mail.ru. He moved from Moscow to Hanoi two years ago and lives there now. Lavrenko, whose office is next to another Russian startup, observes that there is an increasing presence of Russian-related startups in Vietnam. He also pointed out that there are a number of success cases of Russian-developed technology being rolled out in Asian markets. "The strategy depends on whether the team is able to pick the right partner," he said. CocCoc's own approach in Vietnam is more convoluted, and much more capital-intensive. CocCoc opted not to have a local partner, because there has not been substantial local players in this field so far. Instead, as CocCoc has grown its team to 200 people, 40 people had been relocated from Russia, including four Vietnamese nationals who were studying in Russia. Vietnam was a natural choice for Lavrenko and the three Vietnamese founders to set up CocCoc, because there are many Vietnamese students in Russia who speak fluent Russian. Many of the local Vietnamese hires of CocCoc are Russian speakers. No hope for Russia’s hi-tech sector? But there are additional reasons why Vietnam as a market would appeal to Russian Internet entrepreneurs, or in fact, entrepreneurs of any nationality. Vietnam has only 30 percent Internet penetration rate, compared to 60 percent in Russia. The country also has very young demographics compared to Europe or North America. Of the 87 million total population, 43 percent are under 25 years old, and 25 percent are under 15. Apart from the search engine, CocCoc offers a browser for distributing the search engine, a location-based mobile application, and a real-time bidding (RTB) advertising system. Asked about the next step in improving the product, Lavrenko said that it is to continue to "improve the search algorithms". Search algorithms are one of the most important assets of a search engine. They are one of the main ways in which CocCoc is tailored to local needs. The search engine takes into account Vietnamese linguistic constructions and tones, as well as how less educated Internet users in smaller cities or rural Vietnam might construct search terms. Compared to Google which has closed its Vietnam office in 2012, CocCoc's focus on Vietnam and on-the-ground presence are key strengths, according to a Lavrenko's comments in a Tech in Asiaevent earlier this year. Its local presence means that CocCoc has a team of on-the-ground search raters whose job is to evaluate search quality. There is also a team that goes out to everywhere in Vietnam, ranging from the hottest indoor party venues in Hanoi to less accessible tourist sights in smaller cities, marking the GPS coordinates and obtain photos for CocCoc's map and image library. That said, there are several other contenders to rival Google in Vietnam. Wada, also a Russian-financed startup, is focused on building a search engine on a mobile platform. A few other local search engines have also fallen by the wayside over the years. CocCoc's sharp focus on the commercial aspects of the search engine business could just help it win the game. Having studied the experience of Google, CocCoc focuses on generating revenue through advertising and improving its searches by using the anonymous data of its millions of users. It remains to be seen if CocCoc can achieve its goal of surpassing Google as the leading search engine in Vietnam. If it does, it would indeed be a successful case of Russian technology transplanted abroad, with impressive results.